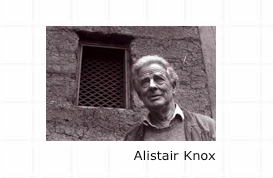 Alistair Knox was the foremost environmental builder of his generation. Inspired by Justus Jorgenson’s mud brick structures at Montsalvat, Knox became one of several poineers of mud brick building in the Eltham district after he returned from service in the second world war. Stimulated by the post-war shortage of building materials of all kinds, Knox began to use ‘recycled’ timber, bricks, slates and stone, eventually developing a truly indigenous style of Australian architecture. The key feature of the many hundreds of homes he constructed in the Eltham area was their relationship to the surrounding landscape. He often worked in close collaboration with Gordon Ford and Peter Glass, both notable landscape designers. His houses were sited within, not on top of, the terrain, and orientated towards the light. Their full-height windows allowed free passage to the outdoors and broke down the distinction between inside and outside. An open hearth and fireplace was the central focus of family and communal life. Alistair Knox accompanied his building with a series of books which outlined his architectural principles and linked his ideas to his political and religious ideals. He took an active part in local politics, and is largely responsible for the preservation of much of Nillumbik Shire as a rural ‘wedge’ today. His legacy is hiden away in the bush of Eltham, but he has inspired many to build with a similar respect and feeling for the landscape and to use the natural materials – particularly mud-brick – of whose beauty and utility he was the greatest exponent.